Very Good. Please contact us if you have any questions. New. Audience: General/trade. Brand new access card. Very good in very good dust jacket. This code can be used only once and cannot be shared. Audience: General/trade. Fair. 032119991X **PLEASE NOTE** This book is in Acceptable Condition. Has wear & tear, writing & highlighting. Regardless of title, CD/DVD/Access Codes or Supplemental Materials are not guaranteed. This is a U.S. Student Edition Book. This book is not a rental. New in new dust jacket. Audience: General/trade. I can email the code Once I get the order. Thanks! Code was cheaper than bookstore and worked fine! Required item for school - it is a code. it is what it is, but the seller got the code to us timely. no complaints. It is just the access code and worked for my class. 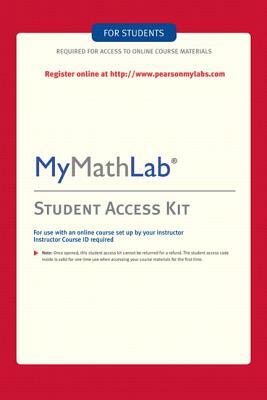 This was a great price and was exactly the access card my daughter needed for her class. Delivery was fast. Great service. Thanks.